I have Edwardian on my mind, because I just finished a late 1910s dress, and photographed it, and am in love with the era in general. 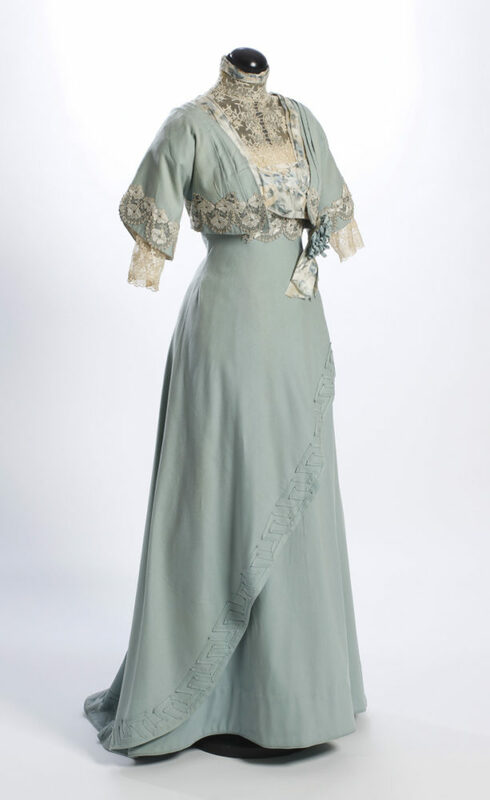 So this week’s Rate the Dress is 1910s, and you get to decide if you’re in love with it in particular. 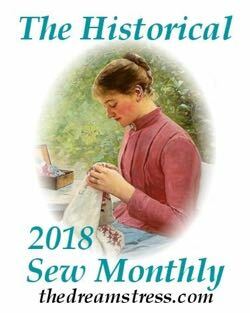 A very, very good show, but the machine woven perfection of the fabric could not match the heart of the hand-embroidered frock the week before. This dress was part of the trousseau of Vendla Brown, neé Hallström (1880-1964). According to the musuem, Velda wore it to the theatre the day after her wedding. The dress is a lightweight wool, decorated on the skirt with greek key meanders, and on the bodice with two different kinds of lace, and a floral silk ribbon. The bodice is finished with a bolero effect. What do you think? An elegant ensemble for a slightly older bride (Velda would have been 33), or too boring, or too many design elements? This is exquisite. Although it might be different in close-up, the lace seems very well coordinated with the main fabric, and I love the calla-lily effect of the skirt draping. There are a few too many design elements, but overall the dress is both attractive generally and an excellent example of its type. I would look drab in it, but a very fair-skinned blonde would shine in it, I think. I could figure this dress out but I think this sounds about right. I’d rate a bit lower as 8/10, though – it keeps feeling to me like it should be something slightly different than it actually is, and that’s too bad for 9. Couldn’t. That’s what posting in the morning on the phone does to you. And I think it really is mostly the floral on the bodice that throws me. Lovely and the colour would look good on a blonde or redhead, the only thing that I don’t like is the ribbon as I think it would have been better without it. However I like plain things and not fussy ones. I love dress, I got married in a very similar colour. Marry in blue you’ll always be true. The cut on (?) sleeves make the bolero look vaguely oriental and I like the scalloped lace at the underbust line. A wider line there makes the waist look smaller. There’s just enough greek key meander on the overskirt to keep it from being plain. I wish there was a back view so we could see how far it extends. I’m in love with this era and the dress is marvelous! The elegant simplicity of the skirt is perfection! Love it. It’s a perfect spring dress, with just enough details, and more sophisticated than girlish. LOVE the skirt drape, which often feels too much/too young with the more sheer overlays. 9 out of 10! I love it!!!! 10! Great color, details, texture, flattering silhouette for almsot anyone. Love it!! The color, design and all the details!! 10 of 10, simply lovely! Oooh, well done, Vendla! Very elegant, not too fussy, and a bit bridal without being over the top. The blunt lines of the bolero make a very pleasing contrast with the sinuous length of the dress. Along with the Greek key, the bolero grounds it, which I think is to its benefit – sometimes these Edwardian gowns can feel like piles of undifferentiated lace and finery. The contrasts help you enjoy the gown’s distinct elements. The dress doesn’t feel very daring or innovative – it might not even be very memorable – but it’s such a lovely outfit. Maybe conventional, but definitely very beautiful. I agree with Heather above that a solid ribbon might have worked better than the floral one, but otherwise this dress is gorgeous and totally befitting a sophisticated newlywed. I’m especially covetous of the lace scallops applied to the bodice. What would one call this color of blue, and does anyone think the wool has faded? Very feminine, but without making her look like mutton dressed as lamb. The color is lovely misty beach-glass green. I’m not happy with the geometric Greek Key on the bottom and the floral lace on the bolero sleeves and top because they are not working together … and the floral print ribbon brings in a third party. for too many disparate elements , -0.5 for each of them! I like the graceful style and the simplicity of the dress, with most of the trimming on the bodice. The style makes the waist look small and the skirt has a graceful flare and looks both elegant but practical too as unlike the hobble skirts the wearer could walk normally in it. Yes yes YES 10 yes. I love the colour and the interest from the floral ribbon. the detail gives the dress extra interest for an evening wear piece. I would think that without that extra decoration it would have been too plain for a lady of substance to wear at night in those times. love the colour and the cut. Love it – so feminine. Perhaps I would do the Grecian key meanders in white to emphasise the curve of the drape and to tie it in with the bodice a bit more. The skirt is just marvelous, I love the swirl of the Greek keys. The bolero is just too fussy for my tastes. Beautiful color, beautiful design. I would Love to have and wear this dress. 10. Possibly a bit too much going on with the two different types of lace, but very pretty and flattering (assuming you’re the right colour to wear it!) and the skirt drape’s clever. If I was going to spend that much on a dress I’d get it made in a less faded-looking and more lively colour. I assume it hasn’t faded, and that it’s actually meant to be that colour? Oh well, I suppose the original owner liked blah shades of beigey-greenish. 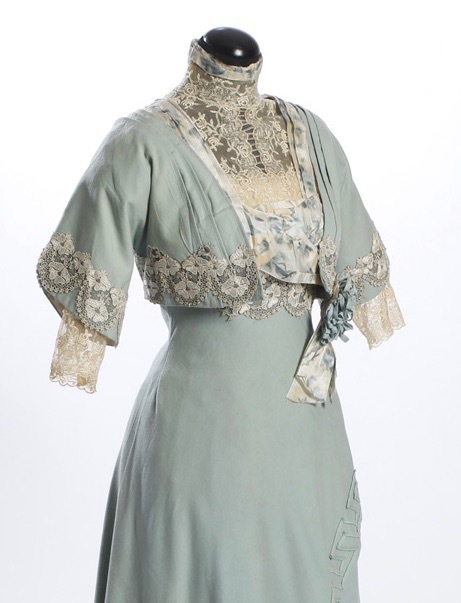 This gown is an exquisite example of the Edwardian Era. The only fault in the design, in my opinion, is the floral ribbon used on the bolero jacket. It’s too fussy, taking the eye away from the gorgeous lace bodice. This gown would be fabulous on brunette with dark hair & blue eyes! A “Winter” if you please. I give it a 9/10! I love it! 10 for sure and on my want to make” list. I love the feminine elegance of this era. Vendla’s backstory is fun to know. I bet she looked fabulous, with a honeymoon glow! There is a lot going on with this bodice, with the high lace and the bolero and the ribbon but I think it works. On such a pale color (is it mint or was it once pale blue? ), it adds some interest. It draws my eyes up and probably gave the wearer a little bust enhancement. 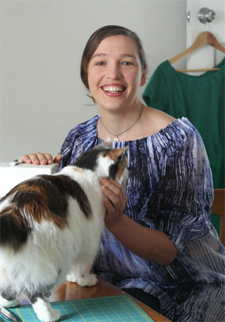 Overall, the dress has a soft effect. Very pretty, Vendla! The Grecian keys look out of place to me. I’m just bothered by them for no reason. This is absolutely darling! It looks perfectly poised and put together. Exactly the thing i would pull out of my trousseau first. The colors lovely, hopefully it looked good on the bride, the smooth line of that skirt is a dream. 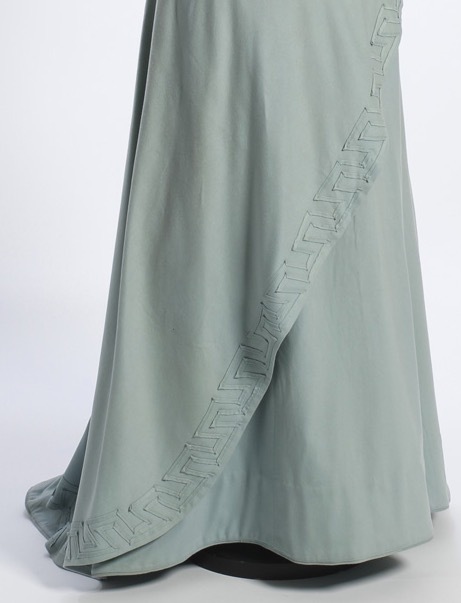 Im less enthused about the greek key motif as it feels unconnected to anything else and a little imprecisely done, but the skirt does need a detail there so i forgive it. 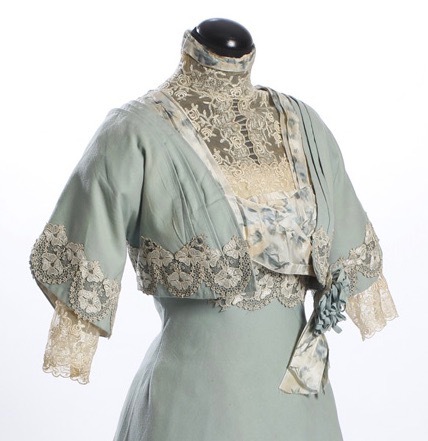 I have a very similar dress from c.1911 which I wore on occasion (when I could still get into it) – the eau-de-Nil color is identical, as are the cream colored lace trim, the lace undersleeves, and the general lines, but my dress is China silk with a small abstract pattern. Eau-de-Nil was a very popular color during this era. It is close to my eye color, so obviously it’s a favorite. In this case, the dress is beautifully made, with subtle elements which would flatter the wearer – if she were slender, a little taller than average – and had green eyes, fair skin, and light brown hair with reddish highlights. As I was, when I wore my own 1911 eau-de-Nil China silk dress to the ball, twenty or so years ago…sigh. There’s nothing wrong with it that I can see. But on the other hand, that is a problem – it’s in such good taste, so refined, so elegant, so tasteful that I kind of desperately want SOMETHING to react to. And there isn’t. So I guess I’m going to take a point off for being TOO safe all around, and it isn’t really a 10/10 dress because it’s not quite got that little zing to make it awesome either. The floral is not quite working with the rest of the elements. I dont like this particular lace on the bolero. The wad of ribbon is uninspired. The greek key detail is lovely in theory, but seems a little sloppy in execution. I dont like the shape of the sleeves. 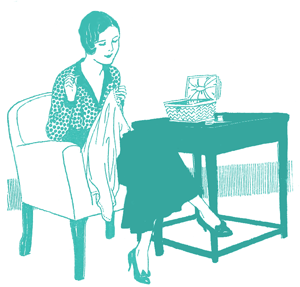 The shape of the skirt is great, and the wool material is lovely. I keep looking at this one and trying to decide how I feel, and I can’t exactly because I don’t feel strongly about it in either direction. I don’t hate it, but I’m not thrilled by it, either. 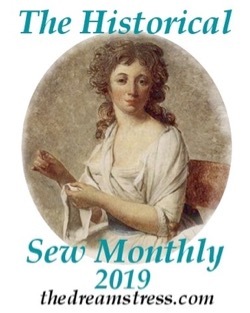 Neither the colour nor the trims do much for me, but I much prefer the overall shape and drape to what’s going to come in the next couple of decades, so rather than split it right down the middle, I’m going to throw it a couple of points for that.